This is our 3-year old on our first Xtracycle. It is converted from a Zize bicycle called the A New Leaf or ANL for short. The ANL was designed for heavier than average riders and makes a excellent steel donor bike. I love the Shimano Nexus Internally Geared Hub and the front disc brake. We are looking forward to a lot more use from our Xtras! 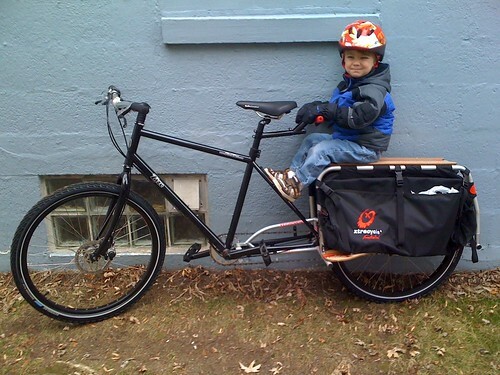 Xtracycle Gallery is the most comprehensive picture gallery of Xtracycle cargo bikes on the planet.